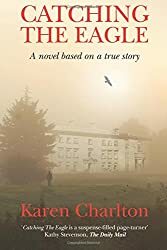 I wanted to read a novel by a local author so I checked the library website for North East writers, where I found Catching the Eagle by Karen Charlton. When 1,157 rent money is stolen from Kirkley Hall, it is the biggest robbery Northumberland has ever known. The owner sends for Stephen Lavender, a principal officer with the Bow Street magistrate’s court in London, to investigate the crime. Suspicion soon falls on impoverished farm labourer, Jamie Charlton, and the unpopular steward, Michael Aynsley. But William is struggling with demons of his own–he is falling in love with Jamie’s wife.’Catching the Eagle’, the first novel in the Regency Reivers series, is a fictionalized account of a trial that devastated a family and divided a community. This is not just by a local author, and set in Northumberland, it is also based on a true story – that of Karen Charlton’s husband’s ancestors. … its huge shadow caressed the ruined walls of crumbling castles and the creaking rotting stumps of ancient gibbets.The eagle plucked unsuspecting prey from the bleak, snow-covered fells and drank from remote rocky waterfalls dripping with golden daggers. It landed in a tree above a labourer’s cottage where Jamie Charlton lived with his wife Priscilla and their children. I like Karen Charlton’s leisurely descriptive style of writing and found the whole book to be fascinating. She has written an even-handed account of the robbery and the subsequent trials, so much so that I began to wonder whether Jamie Charlton was innocent or guilty, although you know from the outset that he was transported as a convicted felon to New South Wales. Did he or did he not steal the money? And what will happen to the eagle? This is the type of historical fiction that I like. The characters come across as real people, with real problems in a real time and place (Northumberland 1809 – 1811). It highlights the social and cultural setting. Jamie was without influence or money behind him up against a judicial system run by people with power who needed to find a culprit. His family suffered along with him as he languished in goal in squalor, where he was caged as he awaited trial – not once, but twice. I wondered whether Stephen Lavender, the detective employed by Nathaniel Ogle, the owner of Kirkley Hall was also a real historical figure. 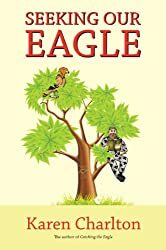 Karen Charlton has also written Seeking Our Eagle, another fascinating book, an account of how she came to write Catching the Eagle whilst researching her husband’s family history. And yes, Stephen Lavender did exist and he was a detective. He later became the Deputy Chief Constable of Manchester after the formation of the police force by Sir Robert Peel. Indeed reading Catching the Eagle reminded me of The Suspicions of Samuel Whicher by Kate Summerscale, featuring Detective Inspector Jonathan Whicher of Scotland Yard, the book that won the Samuel Johnson Prize for Non-Fiction in 2008. Karen Charlton has done her research very well and has written a novel full of intrigue, tension and realism that kept me captivated from start to finish. See her website, Karen Charlton, to read more about Karen and her books. She has also written The Heiress of Linn Hagh, a spin-off novel from Catching the Eagle, which features Detective Stephen Lavender and his sidekick, Constable Woods. And there are more Detective Lavender Series books on the way! As always I didn’t read either book just for any Reading Challenges, but Catching the Eagle does fit very well into a couple – the 2015 Historical Fiction Reading Challenge and the What’s in a Name Challenge, in the book with an animal in the title category and Seeking Our Eagle into the Nonfiction Reading Challenge.